What is “UHD friendly drive”? Risk Tip: We do not recommend that you update the firmware manually to achieve the UHD friendly feature, as this is likely to damage your Blu-ray drive. Because the methods of updating the firmware are very complex, even if you can use some tool software to quickly complete the firmware update, there is still the possibility of failure. If you fail, you may void the warranty. The good news is that there is not any risk if you buy one Plug and Play UHD friendly drive from a professional seller. As manufacturers have gradually discontinued the models of the UHD friendly drive, so it is recommended that you buy one Plug and Play UHD friendly drive as soon as possible before the professional sellers run out of stock. Why should you choose a Plug and Play UHD friendly drive instead of downgrading firmware DIY? Tip: How to switch to your local country for purchase the drives. Tip: How to switch to your local country for purchase the drives. 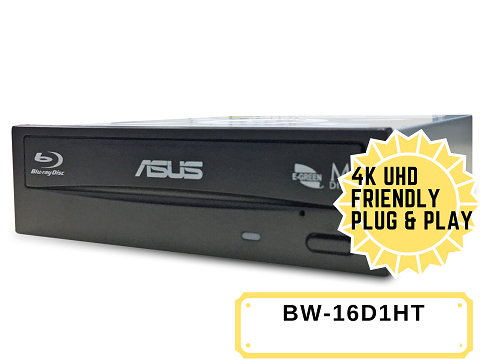 ASUS BW-16D1HT(CA-BW-16D1HT) is a powerful and energy-saving Blu-ray writer which is capable of writing from 16X BD format. Its M-Disc compatibility allows consumers to store their priceless photos or documents for more than 1,000 years, and along with BDXL Support, the maximum data storage is 128GB in one disc. Suitable for anyone who desires a total storage and data backup solution. ASUS BC-12D2HT(CA-BC-12D2HT) combo drive is a powerful and energy-saving Blu-ray disc drive capable of reading from 12X BD format and writing to 16X DVD±R format. With M-DISC Support, users can store their precious memories for millennium. For data protection, BC-12D2HT integrates password controls and encryption plus encoded file name functionality, ensuring information and documents are extra-safe. Availability to read and burn 4K Ultra HD(UHD) Blu-ray Discs. Full compatibility with DVD-Clonerand Blue-Cloner. Availability to read 4K Ultra HD(UHD) Blu-ray Discs. Compatibility with DVD-Cloner and Blue-Cloner. 1000-Year Storage Solution. Save your priceless memories or data for up to 1,000 years. Big-Storage Disc Formats. Move to the future of optical storage with massive BDXL at up to 128GB! The Most Energy Saving Drive. Green idle mode reduces drive operations for up to 50% energy savings. E-Green auto-closes drive application when not in use, saving over 50% power consumption for users. Doubled Data Security. Highest security standards with password control and encoded file name functionality. Password control access and hidden-file folder function. Burn Discs in Three Simple Steps. Drag and drop files to complete super-reliable disc burning in three intuitive steps. Intuitive burning interface in only 3 simple steps to burn a disc. Best Burning Quality Assured. Intelligent drive operation management pre-tests media and assures the best data burning quality. OTS Technology increase burning success rates and provides users fast and high quality operation.